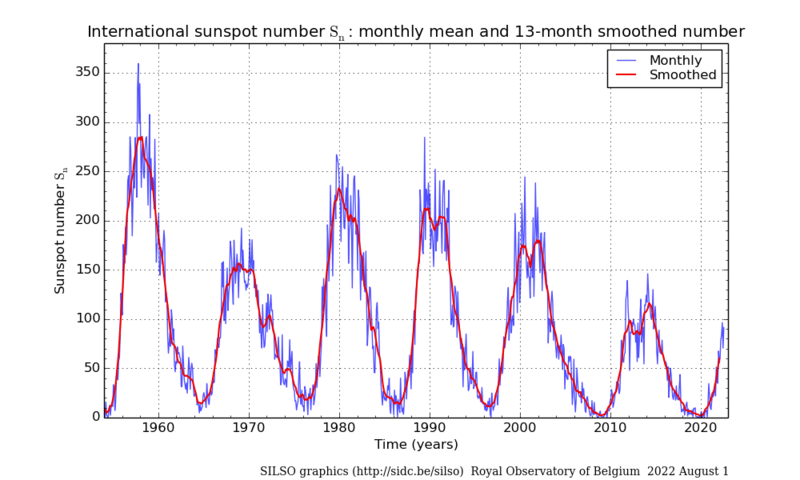 Now that we completed the definitive sunspot numbers for 2014, we can conclude that the maximum of solar cycle 24 was reached in April 2014, with a maximum of the 13-month smoothed sunspot number at 81.8. 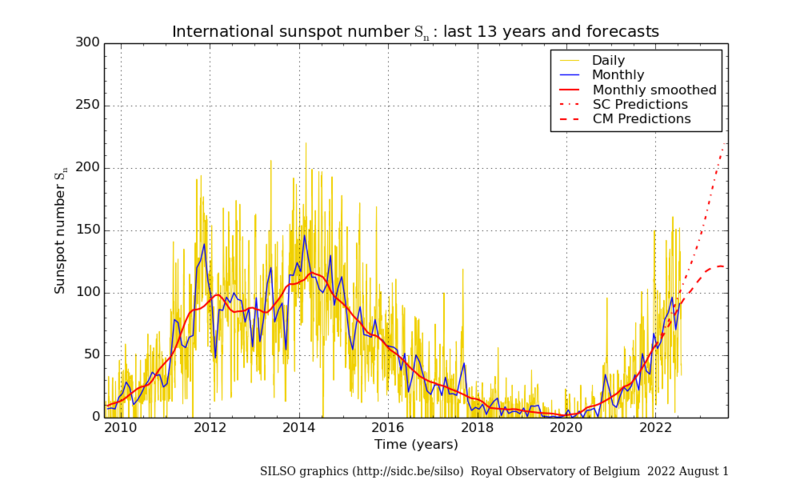 Since then, solar activity has steadily declined (monthly mean sunspot number now around 40), but remained above 70 over many months, probably indicating that the annual mean for 2014 will also mark a yearly maximum at 78.9. Those values exceed the first peak of activity in cycle 24, which occurred in February 2012 but was short and only reached 66.9. Therefore, cycle 24 proves to be 30% weaker than the previous solar cycle, which reached 119.7 in July 2000, and thus belongs to the category of moderate cycles, like cycles 12 to 15, which were the norm in the late 19th and early 20th century. 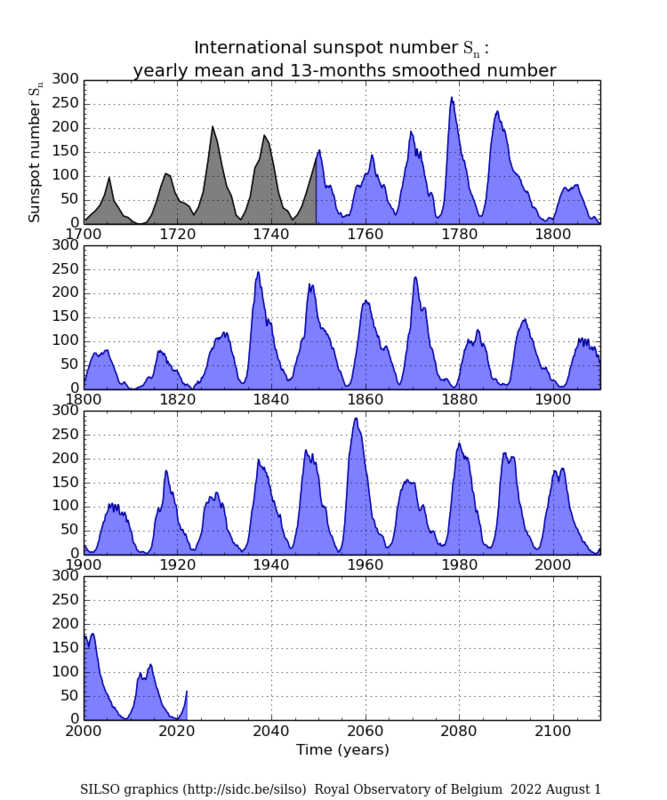 Compared to strong cycles, such cycles typically feature a broader maximum, with a 3-year plateau on top of which two or more surges of activity can produce sharp peaks of similar height (see graphic). In cycle 24, we indeed observed such a scenario, with two peaks separated by a particularly long plateau, lasting 18 months from early 2012 to mid-2013 (see graphic). 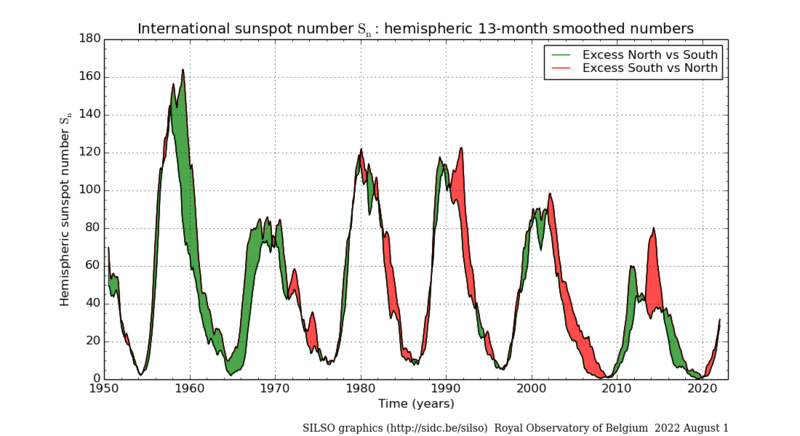 Looking at the hemispheric numbers, we can see that the first peak was actually due to a maximum in the Northern hemisphere in November 2011, while the broader 2014 peak was due to the combination of a maximum in the Southern hemisphere in early 2014 and a slight reversal of the activity decline in the Northern hemisphere. The Southern hemisphere has thus been lagging the Southern hemisphere by about 26 months. This lag isn't new and was already present since cycle 20, i.e. over the last 45 years (see graphic). As this late maximum comes more than 5 years after the preceding minimum in December 2008, cycle 24 must have now entered its long declining phase, as none of the past observed cycles had longer delays between minimum and maximum. Therefore, the average solar activity should progressively decrease towards a minimum around 2020. However, over the next 2 or 3 years, we can still expect other strong but brief peaks of activity caused by the appearance of a few big complex groups, a typical feature of the late phase of solar cycles. Cycle 24 did not say its last word !